This boutique property consists of 12 stylish villas that have been inspired by the Balinese concept. Being passionate about the island's evolving tourism industry, Villa de Daun management is committed to offering every guest a memorable experience by delivering gracious hospitality. 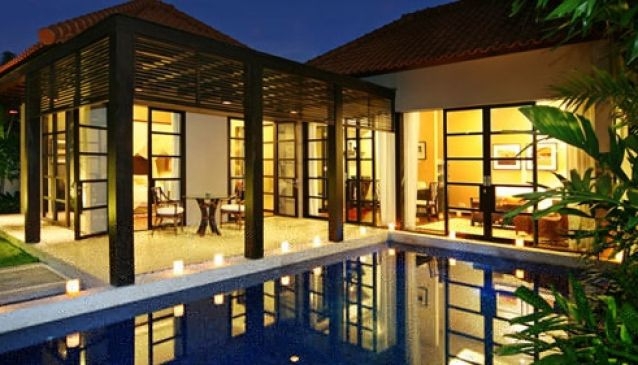 1 bedroom pool villa, 1 bedroom deluxe pool villa, 2 and 3 bedroom deluxe pool villa. Swimming pool, Fully equipped gourmet kitchen, LCD TV with 60 International channels, 5.1 surround sound home entertainment system, Bose Wave music system in Deluxe Pool Villa, Wifi access in villas and open area, de daun Butler Service, Personal chef, car and driver OR, Baby cot OR, Laundry, dry cleaning and pressing service, 24 hour security. The de daun Restaurant, offers variety of fine Indonesian cuisines. Opens daily 7am-10pm. Candlelit romantic dinner. In-villa BBQ of imported meat and fresh seafood cooked to perfection by a private Chef.